As time has gone on, my goal has been to need gradually fewer shore support meetings. This has indeed been working out, and has made it possible for the kind of extended travel that I did this year. Sailing on my own has of course made a big difference with this, and the trip last year included a lot of testing of systems and supplies, with the goal of self-sufficiency in mind. The big issue making shore support necessary is that for the most part I don’t get off the boat. If one is more mobile, it’s perfectly reasonable to tie up near a town and hike in for supplies, and that’s how it’s usually done. Packing for AUKLET has been more like preparations for a remote expedition, except for that if I goof up, it’s a lot easier to get help! 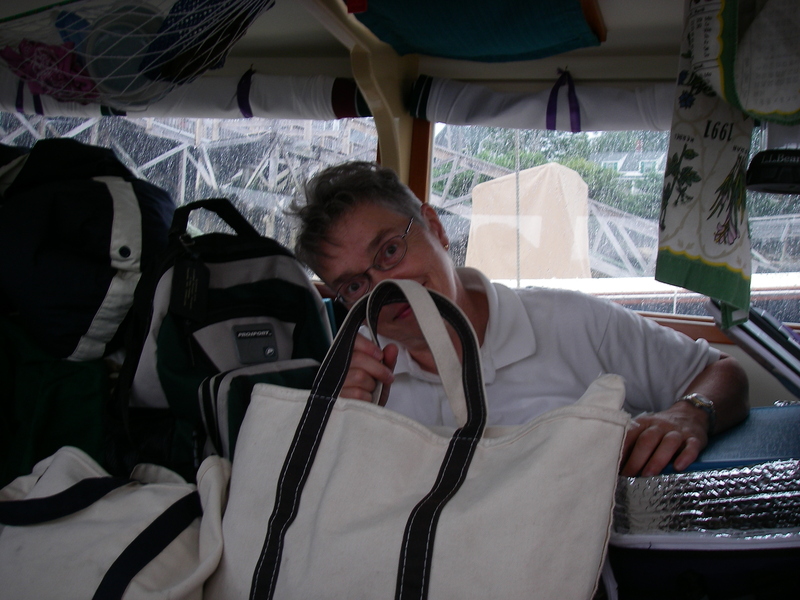 Last year Suzanne made trips by car from Holyoke to locations all along the New England coast, bringing food, water, supplies, and tools for projects. We would meet at marinas or a friend’s dock, exchange a tremendous amount stuff, and work on projects to get the boat more in order. While I was somewhat close to western Massachusetts these would be day trips, and sometimes Theo would come too, helping with specific boat projects of the moment. By the time I was in Maine, Suzanne and I were meeting up about every two weeks, and she was staying over on the boat for a couple of nights, since the drive had become so long. At Belfast – five hours of steady driving from Holyoke – Suzanne said (very understandably!) that that was about as far as she wanted to go. What a gift it was, all those trips. That she did that made the entire seven months of me living aboard AUKLET last year possible. And while that was going on, I was studying, and thinking. Ten years ago, in a different boat, I had sailed to Cutler. DownEast is my favorite place to sail, and I had very much wanted to go back. I love the rocks, and the northern trees, and the remote feel of so few boats on the water. Getting there again was my biggest motivation (besides making less work for my friends) to work things out with fewer shore support trips from home – and this year it worked. The boat was more in order, and all that packing in the spring meant that I was very well supplied. Besides substantial amounts of food that keeps easily, I had seeds and soil for growing some greens, carrots packed in peat moss, and gear for collecting rainwater, as well as a carbon water filter to get the chlorine out of municipal water if need be, or to filter stream water. I had materials for washing clothes, and tools and materials for basic repairs and improvements. For everything other than extra greens and the occasional restaurant food, I was well-stocked. The sweet thing that happened along the way is that a number of people wanted to help! So it turned out that even though I spent quite a bit of time beyond the range of my ordinary shore support, I had an abundance of lovely vegetables, and some really fun restaurant food. Thank you so much to everybody! The bottom line is that for me, with my range of abilities, shore support is what makes this work. But we’ve been successful at getting the amount of shore support needed down into a more manageable range, and it’s been satisfying to become more independent. For one stretch of this summer Suzanne and I went six weeks between meetings, and got together after that span more because we wanted to see each other than because of any pressing need. I still have hopes of sailing into Passamaquoddy Bay, and perhaps to Nova Scotia. With the systems that are now worked out, this could be possible. The process of figuring out ways for me to sail off beyond the horizon has involved an enormous number of people. This has included shore support, crew, and folks at home and along the way who have helped with all manner of things, from home canning chicken, and beef stew, to helping wire the boat, and organizing the million supplies. It has included help with me physically getting into and off of these boats, and moral support – both on and off the boats – during the process of seeing if it would work. When we first took off on SERENITY, I was in pretty tough shape, on the physical plane. During the winter of 2007/2008, after a particularly difficult autumn, I had decided that if I was going to be in such lousy health, I might as well be in such lousy health while floating. A lot of people made it possible to pull that off. As I’ve gotten more strength, it’s become possible to go off on my own. But it’s been a progression, an exploration over the last six years, that has created the foundation that has made what’s going on now possible. People have become part of this project in a number of different ways: Quite a few people have done assistant work for me over the last many years. I used to run ads on craigslist for assistants that included discussion of sailboat projects and shore support. It was a lot of fun just to get to write those ads. And even more fun to work with all the interesting folks who showed up as a result. Friends have helped, and acquaintances along the way. Folks who build boats for a living have done a tremendous amount of creating AUKLET, and making adjustments as the boat has developed. People with a lot of expertise have shared their thoughts and experience, as I sorted out particular ways to make things work, and this process is still ongoing. The broader definition of “shore support” includes every one of these people. It can look like a boat is sailing off alone, with a solitary sailor. But the network that supports that boat is so much more than just the water. I think that this is true of just about every boat, in one way or another, but in this case it’s especially so. I feel like a beneficiary of the Make-A-Wish Foundation, although this project has no actual connection with that organization. But the feeling is there – serious health issues, and a great wish, and that wish fulfilled. My unending thanks go to everybody who has participated in making this happen.